Black Belt 6 th Dan. Mixed Martial Arts & Karate Expert. Trained over 22,000 People in New Delhi & NCR, India. 23 years experience in learning some different form of martial arts. Boxing, Kung-fu, Tai-chi, Taekwondo, Judo, Wrestling, Gymnastics, and Martial Arts Weapons. 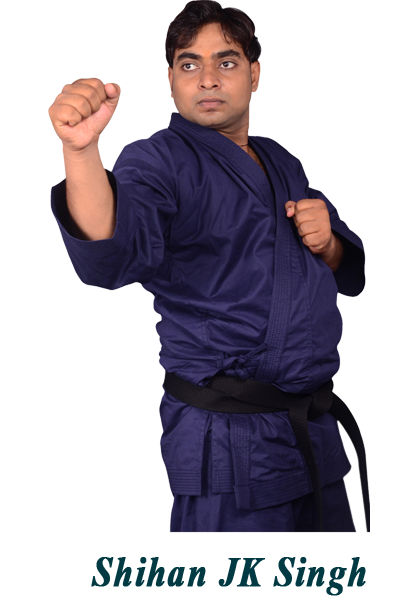 JK Singh is the founder and Shihan (Chief Instructor) of Knockout Martial Arts of Delhi, India and is also recognized as chief instructor of many other international organizations. Shihan JK Singh was learning by the age of eight had already entered the disciplined and rigorous world of Japanese martial arts. Practicing daily, he pursued Shotokan(Karate) from the age of eight until he was fifteen; Kung fu (Chinese martial arts) from the ages of fifteen to eighteen, and Gymnastics from the ages of nine to eighteen and again started Shotokan(Karate) from the ages of eighteen to twenty one. He was also in touch with Indian wrestling by the age of eighteen to twenty one. learned Tai chi(Chinese martial arts) from the age of twenty one to twenty three. He went to the Buddha Temple to learn Martial Arts when he was 8 years old and studied there until the age of 21. During this time he learned some different form of Martial arts. He learns combat techniques up to the age of 17 when he began to study the internal martial arts. A few years later he travelled in India to share knowledge with different masters of different styles and also teach and spread the Martial Arts is a way of life, and it is not exclusively for learning to fight but a journey as well. He has spent 23 years for practicing the martial arts and last 17 years, teaching to students who wish to learn martial arts. In 1997 during the Dragon martial arts tournament he came first in the 50kg open fighting categories where the competitors are allowed to fight with the style of their choice. He also took part in many other competitions and got good achievement. He started to instruct the student in 1998; that time he had one batch with ten players. One of his students of this batch Mr. Suresh Yadav got black belt with the hand of Bruce Lee's wife Miss Linda Lee was the chief guest during the championship in Mumbai and he performed a unique demonstration in front of her. He is known for his decorous behavior that is the salient feature of his success. His institutions look like a flower filled garden for the student. He easily creates an environment with enthusiasm that's become easy for student to learn martial arts. During the training session he is very strict, punctual & hard working. He always feels, it is an onerous task to make his students champion & he proved it, so many times. He has practical and easy way to teach the skills. He always co-operates to promote martial arts. In Our Institution we always try to encourage the students so that he/she can be strong in self defense, self confidence & to make a person physically and mentally strong, to face the world in which we all are living. Success is not a dream, it is our right. We suggest how to get it through the hard work & Smart thought. In 2008 he went to New Delhi and joined the Shito Ryu and mixed martial arts training until 2013. In 2014 Mr. Singh got a chance to learn under Master Shaker Saberi Nassari (Black Belt 10 th Dan), a hard training of Mixed Martial Arts-MMA, Grappling & Brazilian Jiu-Jitsu; forms of full contact.